Darwin's finches (also known as the Galápagos finches) are a group of about fourteen species of passerine birds. They are often classified as the subfamily Geospizinae or tribe Geospizini. They belong to the tanager family and are not closely related to the true finches. The most closely known relative of the Galápagos finches is T. obscura. They were first collected by Charles Darwin on the Galápagos Islands during the second voyage of the Beagle. Apart from the Cocos finch, which is from Cocos Island, the others are found only on the Galápagos Islands. The term "Darwin's finches" was first applied by Percy Lowe in 1936, and popularised in 1947 by David Lack in his book Darwin's Finches. David Lack based his analysis on the large collection of museum specimens collected by the 1905–06 Galápagos expedition of the California Academy of Sciences, to whom Lack dedicated his 1947 book. The birds vary in size from 10 to 20 cm and weigh between 8 and 38 grams. The smallest are the warbler-finches and the largest is the vegetarian finch. The most important differences between species are in the size and shape of their beaks, and the beaks are highly adapted to different food sources. The birds are all dull-coloured. During the survey voyage of HMS Beagle, Darwin was unaware of the significance of the birds of the Galápagos. He had learned how to preserve bird specimens while at the University of Edinburgh and had been keen on shooting, but he had no expertise in ornithology and by this stage of the voyage concentrated mainly on geology. In Galápagos he mostly left bird shooting to his servant Syms Covington. Nonetheless, these birds were to play an important part in the inception of Darwin's theory of evolution by natural selection. On the Galápagos Islands and afterward, Darwin thought in terms of "centres of creation" and rejected ideas concerning the transmutation of species. From Henslow's teaching, he was interested in the geographical distribution of species, particularly links between species on oceanic islands and on nearby continents. On Chatham Island, he recorded that a mockingbird was similar to those he had seen in Chile, and after finding a different one on Charles Island he carefully noted where mockingbirds had been caught. In contrast, he paid little attention to the finches. When examining his specimens on the way to Tahiti, Darwin noted that all of the mockingbirds on Charles Island were of one species, those from Albemarle of another, and those from James and Chatham Islands of a third. As they sailed home about nine months later, this, together with other facts, including what he had heard about Galápagos tortoises, made him wonder about the stability of species. Following his return from the voyage, Darwin presented the finches to the Zoological Society of London on 4 January 1837, along with other mammal and bird specimens that he had collected. The bird specimens, including the finches, were given to John Gould, the famous English ornithologist, for identification. Gould set aside his paying work and at the next meeting, on 10 January, reported that the birds from the Galápagos Islands that Darwin had thought were blackbirds, "gross-beaks" and finches were actually "a series of ground Finches which are so peculiar [as to form] an entirely new group, containing 12 species". This story made the newspapers. Darwin had been in Cambridge at that time. In early March, he met Gould again and for the first time got a full report on the findings, including the point that his Galápagos "wren" was another closely allied species of finch. The mockingbirds that Darwin had labelled by island were separate species rather than just varieties. Gould found more species than Darwin had expected, and concluded that 25 of the 26 land birds were new and distinct forms, found nowhere else in the world but closely allied to those found on the South American continent. Darwin now saw that, if the finch species were confined to individual islands, like the mockingbirds, this would help to account for the number of species on the islands, and he sought information from others on the expedition. Specimens had also been collected by Captain Robert FitzRoy, FitzRoy’s steward Harry Fuller and Darwin's servant Covington, who had labelled them by island. From these, Darwin tried to reconstruct the locations from where he had collected his own specimens. The conclusions supported his idea of the transmutation of species. Seen here is adapted radiation of finch A. (Geospiza magnirostris) into three other species of finches found on the Galapagos Islands. Due to the absence of other species of birds, the finches adapted to new niches. The finches beaks and bodies changed allowing them to eat certain types of foods such as nuts, fruits, and insects. At the time that he rewrote his diary for publication as Journal and Remarks (later The Voyage of the Beagle), he described Gould's findings on the number of birds, noting that "Although the species are thus peculiar to the archipelago, yet nearly all in their general structure, habits, colour of feathers, and even tone of voice, are strictly American". In the first edition of The Voyage of the Beagle, Darwin said that "It is very remarkable that a nearly perfect gradation of structure in this one group can be traced in the form of the beak, from one exceeding in dimensions that of the largest gros-beak, to another differing but little from that of a warbler". By the time the first edition was published, the development of Darwin's theory of natural selection was in progress. For the 1845 second edition of The Voyage (now titled Journal of Researches), Darwin added more detail about the beaks of the birds, and two closing sentences which reflected his changed ideas: "Seeing this gradation and diversity of structure in one small, intimately related group of birds, one might really fancy that from an original paucity of birds in this archipelago, one species had been taken and modified for different ends." The remaining land-birds form a most singular group of finches, related to each other in the structure of their beaks, short tails, form of body and plumage: there are thirteen species, which Mr. Gould has divided into four subgroups. All these species are peculiar to this archipelago; and so is the whole group, with the exception of one species of the sub-group Cactornis, lately brought from Bow Island, in the Low Archipelago. Of Cactornis, the two species may be often seen climbing about the flowers of the great cactus-trees; but all the other species of this group of finches, mingled together in flocks, feed on the dry and sterile ground of the lower districts. The males of all, or certainly of the greater number, are jet black; and the females (with perhaps one or two exceptions) are brown. The most curious fact is the perfect gradation in the size of the beaks in the different species of Geospiza, from one as large as that of a hawfinch to that of a chaffinch, and (if Mr. Gould is right in including his sub-group, Certhidea, in the main group) even to that of a warbler. The largest beak in the genus Geospiza is shown in Fig. 1, and the smallest in Fig. 3; but instead of there being only one intermediate species, with a beak of the size shown in Fig. 2, there are no less than six species with insensibly graduated beaks. The beak of the sub-group Certhidea, is shown in Fig. 4. The beak of Cactornis is somewhat like that of a starling, and that of the fourth subgroup, Camarhynchus, is slightly parrot-shaped. Seeing this gradation and diversity of structure in one small, intimately related group of birds, one might really fancy that from an original paucity of birds in this archipelago, one species had been taken and modified for different ends. In a like manner it might be fancied that a bird originally a buzzard, had been induced here to undertake the office of the carrion-feeding Polybori of the American continent. The most striking and important fact for us in regard to the inhabitants of islands, is their affinity to those of the nearest mainland, without being actually the same species. [In] the Galapagos Archipelago... almost every product of the land and water bears the unmistakable stamp of the American continent. There are twenty-six land birds, and twenty-five of these are ranked by Mr. Gould as distinct species, supposed to have been created here; yet the close affinity of most of these birds to American species in every character, in their habits, gestures, and tones of voice, was manifest.... The naturalist, looking at the inhabitants of these volcanic islands in the Pacific, distant several hundred miles from the continent, yet feels that he is standing on American land. Why should this be so? why should the species which are supposed to have been created in the Galapagos Archipelago, and nowhere else, bear so plain a stamp of affinity to those created in America? There is nothing in the conditions of life, in the geological nature of the islands, in their height or climate, or in the proportions in which the several classes are associated together, which resembles closely the conditions of the South American coast: in fact there is a considerable dissimilarity in all these respects. On the other hand, there is a considerable degree of resemblance in the volcanic nature of the soil, in climate, height, and size of the islands, between the Galapagos and Cape de Verde Archipelagos: but what an entire and absolute difference in their inhabitants! The inhabitants of the Cape de Verde Islands are related to those of Africa, like those of the Galapagos to America. I believe this grand fact can receive no sort of explanation on the ordinary view of independent creation; whereas on the view here maintained, it is obvious that the Galapagos Islands would be likely to receive colonists, whether by occasional means of transport or by formerly continuous land, from America; and the Cape de Verde Islands from Africa; and that such colonists would be liable to modification;—the principle of inheritance still betraying their original birthplace. Whereas Darwin spent just five weeks in the Galápagos, and David Lack spent three months, Peter and Rosemary Grant and their colleagues have made research trips to the Galápagos for about thirty years, particularly studying Darwin's finches. Here, we look briefly at the case of the large cactus finch Geospiza conirostris on Isla Genovesa (formerly Tower Island), which is formed from a shield volcano, and is home to a variety of birds. These birds, like all well-studied groups, show various kinds of morphism. Males are dimorphic in song type: songs A and B are quite distinct. Also, males with song A have shorter bills than B males. This is also a clear difference. With these beaks, males are able to feed differently on their favourite cactus, the prickly pear Opuntia. Those with long beaks are able to punch holes in the cactus fruit and eat the fleshy aril pulp, which surrounds the seeds, whereas those with shorter beaks tear apart the cactus base and eat the pulp and any insect larvae and pupae (both groups eat flowers and buds). This dimorphism clearly maximises their feeding opportunities during the non-breeding season when food is scarce. If the population is panmixic, then Geospiza conirostris exhibits a balanced genetic polymorphism and not, as originally supposed, a case of nascent sympatric speciation. The selection maintaining the polymorphism maximises the species' niche by expanding its feeding opportunity. The genetics of this situation cannot be clarified in the absence of a detailed breeding program, but two loci with linkage disequilibrium is a possibility. Another interesting dimorphism is for the bills of young finches, which are either 'pink' or 'yellow'. 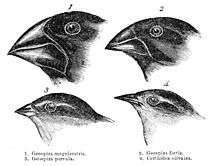 All species of Darwin's finches exhibit this morphism, which lasts for two months. No interpretation of this phenomenon is known. For some decades, taxonomists have placed these birds in the family Emberizidae along with the New World sparrows and Old World buntings (Sulloway 1982). However, the Sibley–Ahlquist taxonomy puts Darwin's finches with the tanagers (Monroe and Sibley 1993), and at least one recent work follows that example (Burns and Skutch 2003). The American Ornithologists' Union, in its North American check-list, places the Cocos finch in the Emberizidae but with an asterisk indicating that the placement is probably wrong (AOU 1998–2006); in its tentative South American check-list, the Galápagos species are incertae sedis, of uncertain place (Remsen et al. 2007). Developmental research in 2004 found that bone morphogenetic protein 4 (BMP4), and its differential expression during development, resulted in variation of beak size and shape among finches. BMP4 acts in the developing embryo to lay down skeletal features, including the beak. The same group showed that the development of the different beak shapes in Darwin's finches are also influenced by slightly different timing and spatial expressions of a gene called calmodulin (CaM). Calmodulin acts in a similar way to BMP4, affecting some of the features of beak growth. The authors suggest that changes in the temporal and spatial expression of these two factors are possible developmental controls of beak morphology. In a recent study genome sequencing revealed a 240 kilobase haplotype encompassing the ALX1 gene that encodes a transcription factor affecting craniofacial development is strongly associated with beak shape diversity. ↑ Sato, Akie (2001). "On the Origin of Darwin's Finches" (PDF). Oxford. 1 2 Grant, K. Thalia and Estes, Gregory B. 2009 "Darwin in Galapagos: Footsteps to a New World" Princeton University Press, Princeton. ↑ Keynes 2000, p. xix. ↑ Darwin 1839, p. 462. ↑ Darwin 1845, p. 380. ↑ Darwin 1859, pp. 397–398. ↑ Huxley J. 1955. Morphism in birds. 11th Int Ornith Cong (Basel 1954, p309-328) touches on this theme. ↑ B. Rosemary Grant and Peter R. Grant 1989. Evolutionary dynamics of a natural population: the large cactus finch of the Galápagos. Chicago, p241 first para. ↑ Grant, Peter R. 1999. Ecology and evolution of Darwin's finches. Princeton NJ, p428 in Afterword. ↑ Maynard Smith J. 1998. Evolutionary genetics. 2nd ed, Chapter 5, Oxford. Burns, Kevin J.; Skutch, Alexander F. (2003), "Tanagers and Tanager-Finches", in Christopher Perrins, ed., The Firefly Encyclopedia of Birds, Firefly Books, pp. 629–631, ISBN 1-55297-777-3, retrieved 2007-04-09 It is not clear whether this placement was made by Burns and Skutch or by Perrins. Sibley, Charles G. (1993), A World Checklist of Birds, New Haven, Conn.: Yale University Press, ISBN 0-300-07083-7, retrieved 2013-12-06 Monroe and Sibley consider the tanagers to be a tribe (Thraupini) of a big family Fringillidae rather than a family of their own (Thraupidae). Wikimedia Commons has media related to Darwin's finches. Grant, K.T. and Estes, G. B. 2009. "Darwin in Galapagos: Footsteps to a New World" Princeton University Press, Princeton. Galapagos Online. List of birds of the Galapagos Islands. Fink F.A.Q. Darwin's finches inspired the naming of the Fink project, a collaborative initiative for porting open source software to the Darwin platform to enable its use and evolution in the Apple Mac OS X environment. "Fink" is the German name for "finch." Aug 2006 Nature Article that shows how modulation of a certain gene during development can account for the differences seen in beak shape.